What's behind the name, the "Haus", the bean, and its loyal following? The name "Prodomo" is derived from the Latin "for the home". The home or house theme plays well at Dallmayr. This family-owned German Coffee company has a 300 year-old heritage at it's headquarters in this stately "Haus". The building was all but destroyed during the second world war and lovingly reconstructed in the 1950s to its former glory. While Dallmayr holds the title of "Purveyor to the Royal Bavarian Court" in its hometown of Munich, it has also supplied 14 other royal houses throughout Europe. The Haus of Dallmayr, located at Dienerstraße 14, München, Germany, is famous for its coffee and even for its tea, cocoa, and chocolate. Visitors to Munich are drawn to its world-famous delicatessen, bakery, and gourmet food shop. Yes; the pastries actually really do look as sumptuous as in this photo and they taste as scrumptious as they look. Over 1.4 million tourists visit this institution of fine dining, rivaled only by the same number of locals who flock there whenever they decide they must treat themselves to the "best of the best"; an elegant five-course dinner; a humble crusty roll with cold cuts, or a plate of delicately-smoked salmon. Please note, this is no ordinary delicatessen; its a hallmark of fine European cuisine. If you visit Munich, make the Haus of Dallmayr part of your agenda. Here in the USA consumers are likely to be most familiar with Dallmayr's Prodomo coffee. 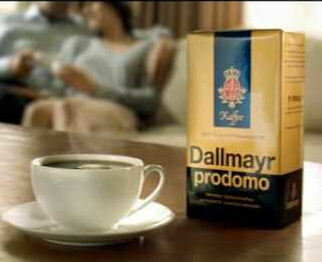 The online store, GermanDeli.com, hails Dallmayr Prodomo coffee as one of its top-selling items among thousands of other German and European products. As in Germany, where Prodomo has a strong following and is available in most supermarkets, I'm beginning to see this coffee appearing on grocery shelves across the USA. Dallmayr has a solid distribution chain for its Prodomo brand, in particular, and even though it is considered to be a "gourmet brand" the price is still affordable for most household budgets. 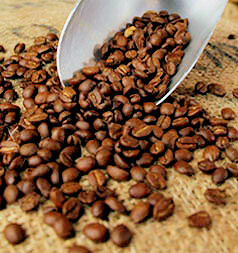 Prodomo uses only select 100% Arabica and that's the finest coffee bean you can buy. The Prodomo roast is "Medium" and satisfies most coffee-drinkers. It is full-bodied, but Prodomo has been refined to remove bitterness and irritants. The lower acidity level helps to make Prodomo easier on the stomach. The aroma is pleasant and rich, and enhances the taste-experience for Prodomo-drinkers. It's available in whole bean form, as a ground coffee, in a milder version, and even decaffeinated. For the optimal flavor, Dallmayr recommends 7 grams of ground Prodomo for each 8-ounce cup of coffee in a standard drip-style brewing machine. A level teaspoon of ground coffee equals about 6 grams. Therefore, for an 8-cup brewer try using about 9 level tablespoons of Prodomo. Obviously, you may need to change that basic recipe if you prefer your coffee a little stronger or a little less strong. This is just a starting point. If you are in München, please buy it at the Haus of Dallmayr. But don't be surprised to see Dallmayr Prodomo in your local supermarket here in the USA. Yes; it's really becoming that popular! Naturally, you can also visit the "Prodomo Coffee" page at www.GermanDeli.com and shop online. GermanDeli.com has been around for the last 14 years serving those lusting for goodies from the Heimatland. FULL DISCLOSURE: I'm one of the owners. And I am a very proud owner. Why? Well, because we really do have the best selection of German, Austrian, and Swiss food in the USA. We have on average 3,500 products in stock in the summer and almost 5,000 products October - December. And we really do know how to ship chocolate and meat in the middle of a hot summer from hot Texas to hot Florida or anywhere there is a heatwave. And our customer service is top notch! Oh, and we have the best slogan in the business: "It's not about the food; It's about the memories." Just ask any German who has been away from Germany for more than a week or two and I bet they will agree. May is a special month in Germany, often celebrated with a Maifest (May Festival). If the timing is right, many towns try to hold their festivals on the first of May, or as close to the first of May as possible. However, the official kickoff of spring can be scheduled anytime during the month of May. It's traditional to set up a Maibaum (Maypole) where brightly colored ribbons are intertwined around the pole as dancers perform intricate movements in a circle around the pole. Parades, music, festival food, and rides for the children are typical, but some communities try to outdo each other by organizing events that include crowning a Maikönigpaar (May King and Queen) and feature elaborate galas where festival-goers dress to impress. The official drink of these festivals is a Maibowle (May Punch). Recipes can vary, but typically include a mixture of white wine and sparkling wine (Sekt) and, very often, a syrup called "Waldmeister" (made from the Sweet Woodruff plant) is added to give the punch extra flavor and the traditional light green color that reminds everyone of the fresh grass and leaves we look forward to seeing after the winter snows melt away. 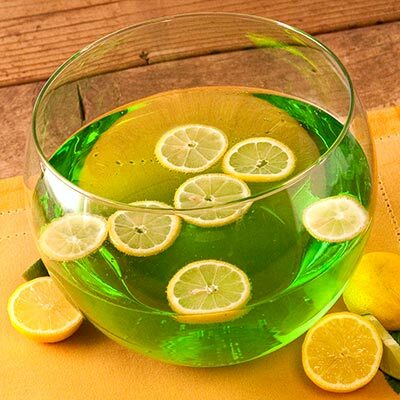 Germany's May Punch (Maibowle) is often a spring green color. Remove zest from 2 limes, then slice limes. Juice the other 3 limes to make 6 tbsp lime juice. Pour chilled wine into a large punch bowl. Add Waldmeister syrup, lime zest and lime slices to wine. Add champagne & serve immediately. All amounts are approximate. Feel free to adapt the recipe to your taste.